If you are the director of a company placed into liquidation, you won’t necessarily be banned from acting as a director of another company. This is because ASIC recognises that businesses may fail for various reasons – often outside a director’s control. There are, however, three main scenarios where you may be disqualified from acting as a director of another company for a period of time. If you become bankrupt, you are disqualified from being a director of a company for the period of your bankruptcy, which is usually three years. Similarly, if you enter into a Personal Insolvency Agreement, you’re also excluded from being a director for the period of the agreement. A Personal Insolvency Agreement is an alternative used to avoid bankruptcy. The duration of the agreement may be short, say three months, or it may run for a number of years, depending on the terms of the agreement. The liquidator of those companies has lodged a report pursuant to Section 533 of the Corporations Act (which provides details of any misconduct that occurred in relation to the company). Whether disqualification would be in the public interest. If ASIC considers that a person should be banned from acting as a director of further companies, they will give that person notice and the right to make submissions as to why they should not be banned. After considering these submissions, there may be a hearing chaired by a delegate of ASIC to consider a director’s conduct and any submissions that the director and ASIC may wish to make. To the Federal Court of Australia afterwards. For directors who have received notice from ASIC that they are considering banning them from being a director of companies in the future, it is best to be proactive and engage a professional advisor to assist with reviewing relevant material and acting in making necessary submissions to ASIC as to why director banning should not apply. In this regard, in the past, we’ve made submissions to ASIC on behalf of a number of directors to help them avoid director banning. This has assisted directors avoid being banned by ASIC and avoid the significant costs which may be associated with appealing a decision to the AAT or the Federal Court of Australia (should the director wish to proceed in this manner). 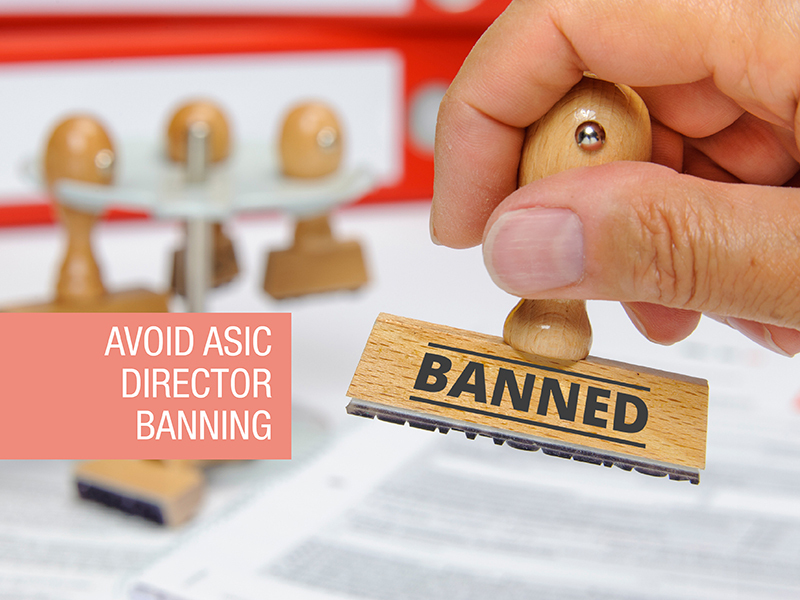 In certain rare cases, ASIC can also ban someone from acting as a director of a company if they have been involved in serious misconduct. However, to be banned on these grounds ASIC will usually be required to obtain a Court Order banning the individual from acting as a director for a period of time. The person who is the potential subject of director banning in these circumstances naturally has the ability to be represented in proceedings brought by ASIC and to make submissions to the Court as to why director banning should not apply. Concerned about ASIC director banning, or being excluded from being a director, and need assistance? As set out above, we have made submissions in the past on behalf of a number of directors to help them avoid ASIC director banning. If you have any questions about director banning or would like some advice or assistance, don’t hesitate to get in contact.